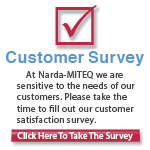 L3 Narda-MITEQ has supplied Cryogenic Amplifiers for over 18 years. Typically, the customer provides the cryogenic cooling, but we have supplied some amplifiers with built-in cryogenic cooling systems. 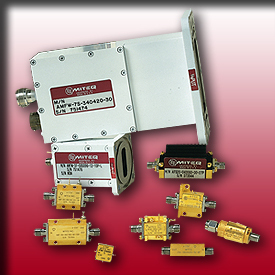 Our broadband low noise Cryogenic Amplifiers are often of interest to Radio Astronomers for use in radiometers. For Cryogenically Cooled Amplifiers, improvements in noise figure depend upon the type of FET used. pHEMT FETs have improved noise figures down to 77K, and mHEMT and InP devices improve down to 4K. Discrete InP FETs are difficult to obtain and difficult to work with and are rarely used. To reduce the thermal load on the cooling system and the thermal rise of the junction, the voltage regulator is placed outside the cooled zones, and the supply voltage is made as low as possible. In addition, voltage regulators do not operate at cryogenic temperatures. Many of our designs are mechanically sound to 77K, or even down to 4K. Because of potential stability problems, we generally do testing at or near 77K.